Mother’s Day Giveaway! Ends May 18th 2012! Click here to see the images and value of the prizes listed above. Note: All items will be shipped to the winner within one to three weeks after the end date of this giveaway. Non-cash items are not convertible to any form of money. What are you waiting for? Enter on the rafflecopter below for a chance to win! 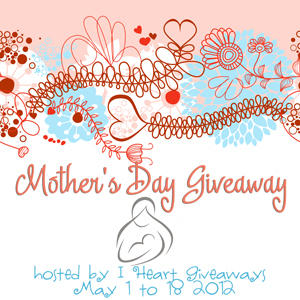 Mother’s Day Giveaway will accept entries until May 18, 2012. Open worldwide.